The silent assassin Spinister is more intelligent than most Decepticon lackeys. Subtle enough to keep his personal agenda a secret from his superiors, he was last seen traveling to Cybertron in the company of Nemesis Prime, dark clone of Optimus Prime and servant of the World Eater Unicron. Although the purpose of their alliance remains a mystery, their success can only spell disaster for the Autobots and their allies on Earth. The name & character of Nemesis Prime have been in use since Armada in 2003. Most iterations have been an evil clone or alternate universe version of Optimus Prime. The character has also been (and for some fans is the way to associate him) Scourge from Robots in Disguise. Personally, I have always fancied Nemesis Prime better, but I'm more of a Classics guy. 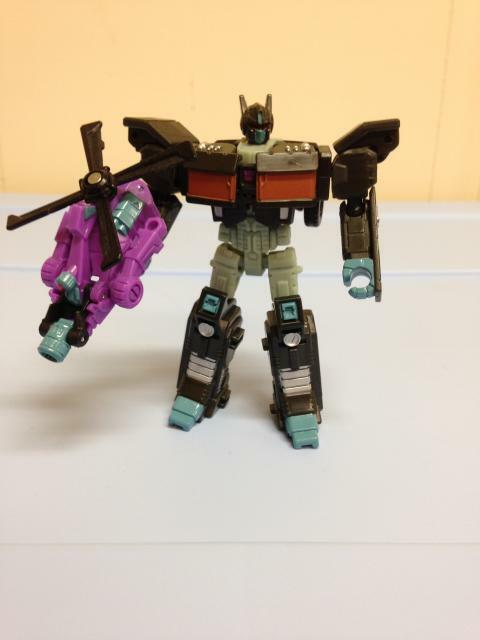 The name Scourge in my brain is associated with Galvatron, Cyclonus and the Sweeps from Generation 1. This version of Nemesis is of the ever-present Optimus clone type, and also a servant of Unicron. Spinister has been around since G1, and ironically that version was a Targetmaster paired with Singe and Hairsplitter which combine into one gun. Spinister has the reverse role this time around, being the weapon and partner of Nemesis Prime. 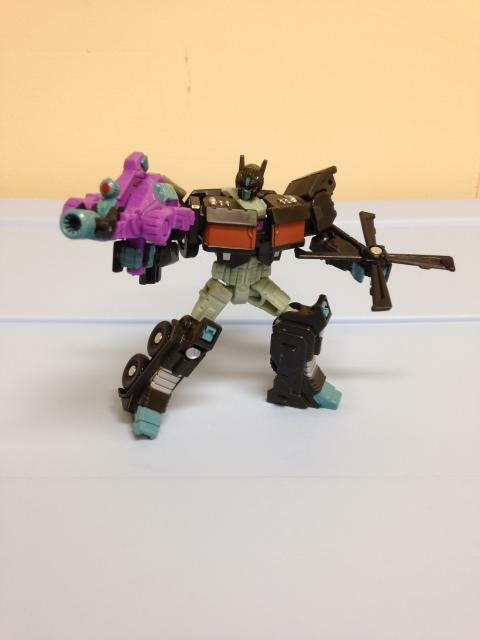 Having missed out on the SDCC 2008 (and later Hasbro Toy Shop) release of Classics Nemesis Prime, I had my opportunity to pick up this version with Spinister. Nemesis Prime does not disappoint! 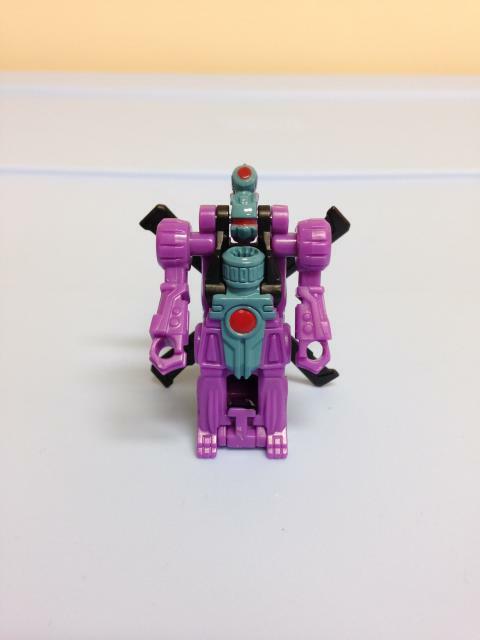 Spinister is a mini-con, mostly in purple with a tiny bit of black, teal, and red thrown in. You won't find a ton of detail in any mode, but for what Spinister is, I suppose he gets the job done. As a robot, Spinister can't do much at all. His legs are immovable, and his arms only swivel. 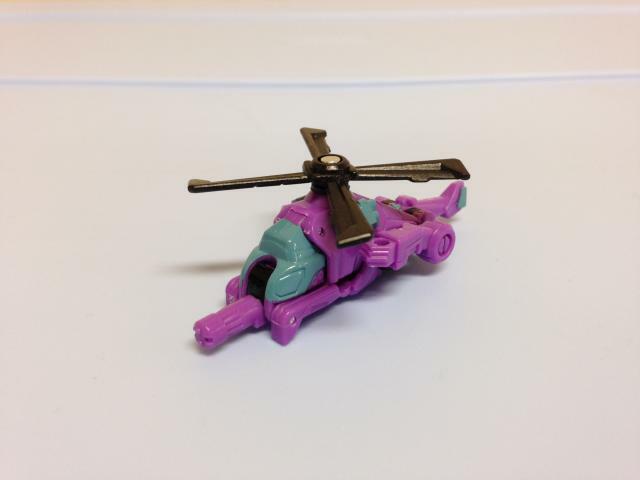 As a helicopter, Spinister can spin his blades. And his arms are not hidden. As a gun (which is a very simple transformation, akin to Flanker who came with Swerve) Spinister doesn't anything besides, well, be a gun. On the plus side, you can detach the blades to use as another weapon for Nemesis. I guess that's a bonus? It looks quite silly either way. Overall, Spinister is a complete pass. He doesn't offer much to the package, but I don't feel that he hurts the package. At least his color palette kind of matches that of Nemesis. Nemesis Prime's alternate mode is a cab-over semi-truck. There's really not much to discuss here; the truck rolls well, everything is tabbed in nicely (though you can still bend the knees), and the paints apps are well done. Some nice silver striping is present all round, which adds some depth to an otherwise bland truck. The top & front lights, grill, and front bumper are all silver as well, with minor teal detailing and red windows. 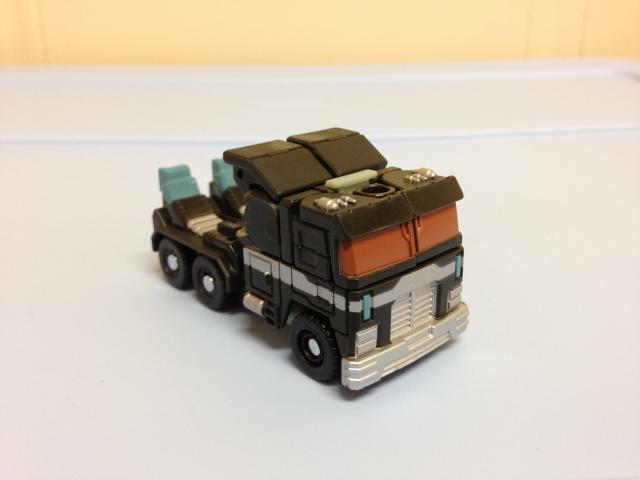 Hasbro could have been lazy and left the whole truck matte black plastic - kudos for putting in a bit of extra effort. Overall the truck mode is a solid effort. After a simple and fun transformation (think Voyager class Classics Optimus Prime, in Legends size), Nemesis Prime is in robot form. Aesthetically, Nemesis Prime is fantastic. There's great contrast between the grey and black plastics, and there is an abundance of silver, teal, and red paint detailing. I was surprised at the level of paint detail on the head - teal faceplate and forehead, red eyes! Personally, I think the mold design is much more fitting for Nemesis than Optimus, as the back-swept 'ears' on the helmet have a more aggressive look. The purple Decepticon logo in the chest is decently visible, and the rest of the paint apps really bring out the details on the robot. Well done, Hasbro. Well done. Nemesis is quite bendy and balanced due to all of his ball joints. Shoulders, elbows, hips, and knees all have a great range of motion; the only slightly hindered joint is the shoulder, which can be alleviated by flipping up the top portion of the shoulder a bit. Honestly I can't think of another reason for the shoulder to be designed like that, and it works well enough. The neck and torso swivel too, giving Nemesis a great deal of movement for positioning. Even though Nemesis has a slight backpack, the joints are stiff and the weight is well distributed, allowing for good balance. For a small price and a small figure, Nemesis Prime is a worthwhile use of your money. He's easy and fun to transform, well balanced and articulated, and has a weapon he can wield in a couple different ways. As a toy and a display piece, Nemesis Prime & Spinister won't disappoint. Transformation Design: 8. Surprising how much this transformation is like Voyager class Classics Prime. It's enjoyable, not frustrating at all, but complex enough for a little guy. Durability: 8.5. I suppose some joints could wear over time, and Spinister's blades could break easily. Overall quite stout. Fun: 9. I really like these new Legends class figures. For a cheap price you get a well articulated figure that poses well and looks good. Throw in (or throw away?) a mini-con with a couple passable modes, and you have a nice combination of fun for the money. Aesthetics: 9. If you're bugged by the size class, he won't fit into your collection. For what he is, he looks great, the paint applications are done well, and the color combination is fantastic. I think the mold design fits Nemesis better than Optimus. Articulation: 9. Pretty good ball joints around, especially for the Legends class. The shoulders are a tiny bit cramped, but that can be alleviated by flipping the tops up. Value/Price: 7.5. Prices have increased across the board. Legends figures that used to be $5 are now $10 USD, with a mini-con. The inclusion of the mini-con surely bumps this into the $10 price point, but it could have easily been left out and Nemesis sold as is for $7-8. Still good for the money, IMO. Overall: 8.5. Nemesis Prime is a great pick up. Articulate, a good paint job, and an added mini-con for a bit of fun. There really isn't any incredible reason to hunt him down, but you won't be disappointed in Nemesis Prime if you buy him.